New York Guard 1st Sgt. 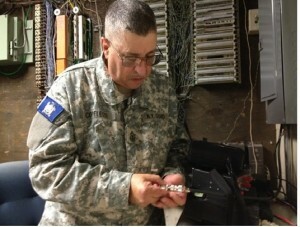 Mark Copeletti, 56th Brigade, from New Windsor, N.Y., performs an equipment check on a Military Emergency Radio Network receiver at the Joint Task Force Sandy operations center Nov. 6, 2012. The MERN provides back-up communication capabilities for the National Guard response to emergencies such as Superstorm Sandy. Photo by Sgt. 1st Class Dave Konig, 56th Brigade, New York Guard. CAMP SMITH TRAINING SITE, CORTLAND MANOR, N.Y. More than 75volunteers of the New York Guard completed their first full year of monthly communications exercises using the Military Emergency Radio Network (MERN) here May 2. The communications system links military and civilian radio operators to create a sustainable emergency radio network during a disaster. While most of the communication stations involved use fixed-site radios, this year introduces “Mobile MERN” elements, allowing New York Guard communications experts to locate closer to an incident site. New York Guard personnel begin training this August during New York Guard Annual Training with vehicle-portable high-power radio equipment that will give MERN operators unprecedented tactical interoperability with New York State’s emergency responders. Mobile MERN will also create the ability to place low-cost, high-power communications units anywhere National Guard forces are deployed in the state. “We’re going to have over 100 boots on the ground by 2016,” said New York Guard communications officer Lt. Col. Barry Greene. Greene credited service component partners in the National Guard, as well as other supporting New York state agencies, federal military and civilian radio operators for their tremendous training and operational support. “We will continue to make sure our soldiers are trained up, and ready to respond,” Greene said.